Chef Kevin King and proprietors Jeff Callaghan and Geremie Callaghan hosted an intimate gathering at Fluke Wine Bar and Kitchen amidst the pleasant off-season atmosphere of Bowen's Wharf, Newport. In attendance were about forty guests and featured speakers Kim Hyde (marine scientist, NOAA) and Timothy Caldwell (commercial fisherman, Portland ME and Pt. Judith, RI). In between the delightful courses prepared by Chef Kevin and his team, conversation among speakers and guests led to two takeaways: first, that changes in the base of the food chain (phytoplankton) can have a big ripple-effect, extending all the way up the chain to the fish we harvest and eat; and second, that the seafood counters at our grocery stores are guilty of greatly under-representing the variety of life found in our local seas! 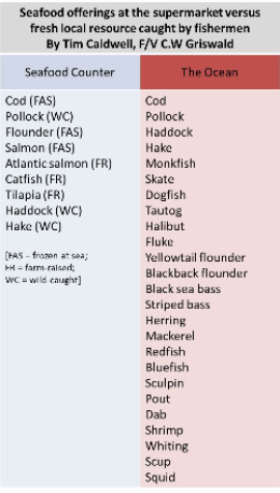 Speaker Tim Caldwell prepared a telling graphic illustrating the chasm between what is available in the ocean and what is available at the seafood counter (at right). Fluke Wine Bar and Kitchen, Bowens Wharf, Newport. 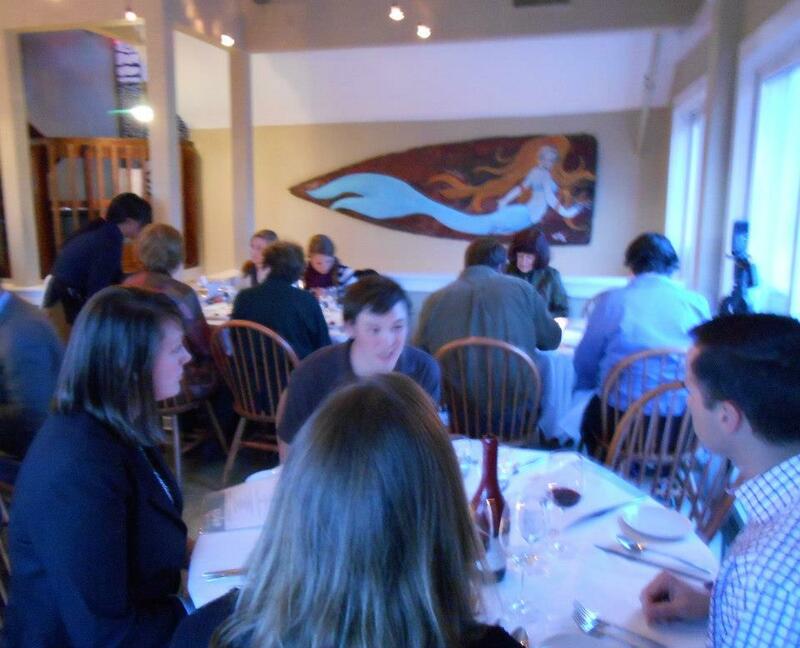 The walls were adorned with whimsical seaweed prints created by Jamestown artist Mary Chatowsky Jameson. Each guest received a pack of informational cards describing different aspects of the Gulf of Maine ecosystem. The man behind the meal: Chef Kevin at work in the kitchen. The night kicked off with a cocktail reception in the restaurant's second story, with a gorgeous view of Newport Harbor and an extensive selection of cocktails prepared by bartender Klaus. Garnishing the first course: Maine shellfish trio. Maine shellfish trio, with oysters, lobster, and Jonah crab. Guests enjoy the shellfish trio, with sunset occurring outside. The invited speakers get to know one another. Chefs plate the second course: smoked herring. 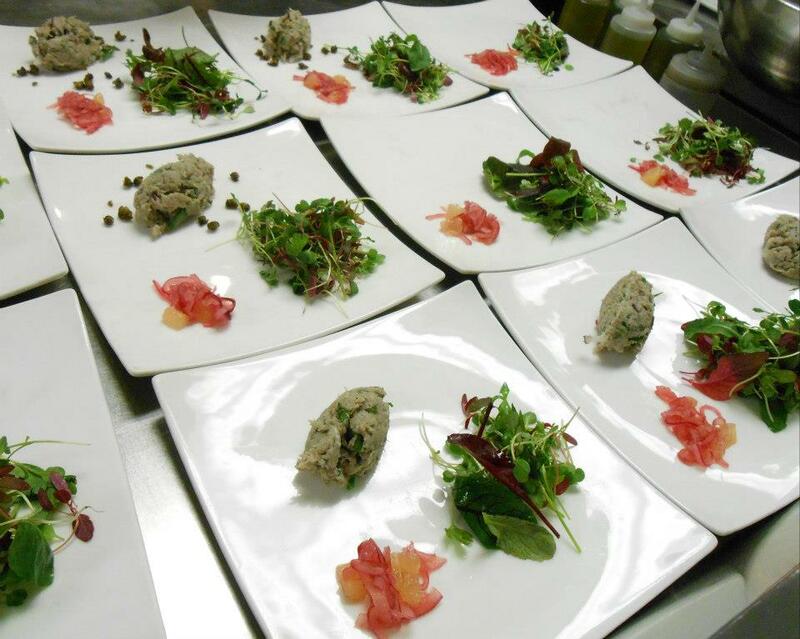 Smoked herring, with pickled onions, baby greens, lemons, and fried capers. Oceanographer Kim Hyde (NOAA Narragansett Lab) discusses changes in the phytoplankton community in the Gulf of Maine. 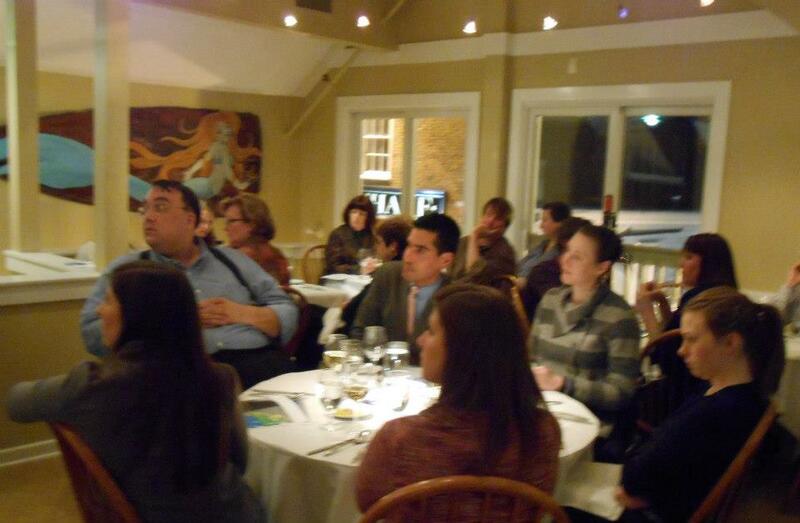 Guests listen intently as Kim Hyde explains a shift in the average size of phytoplankton in the Gulf of Maine. Third course: Seafood farrotto, with mussels, mahogany clams, sea urchin, spring peas, and sorrel oil. Raw Acadian redfish fillets, ready for the skillet. 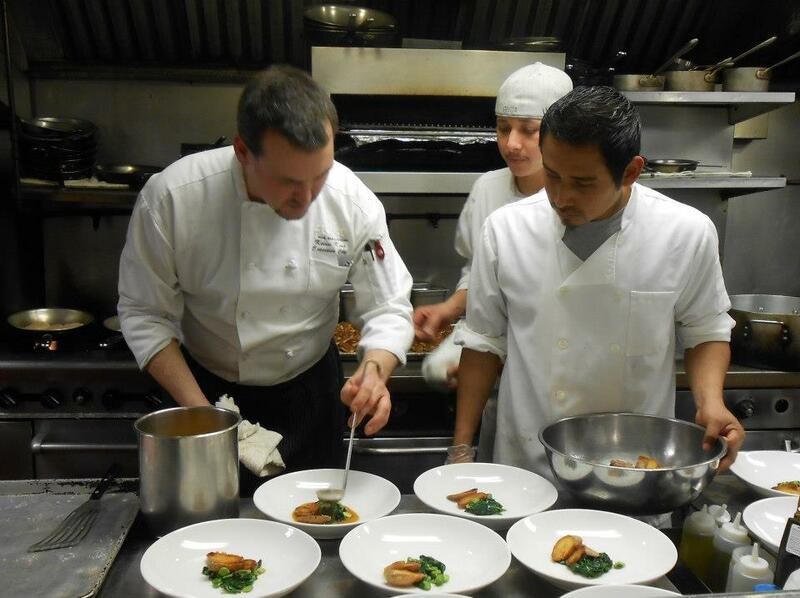 Chefs plate the fourth course: Acadian redfish. Guests enjoy the delectable fruits of the Gulf of Maine. Dessert: buttermilk panna cotta with meyer lemon compote and suger kelp shortbread. Timothy Caldwell hails from Portland, Maine. He has worked on tug boats and supply boats in Alaska, only to be drawn back to fishing time and time again. He has been on the water for almost a decade, and has fished the coast all the way from mid-coast Maine to the tip of Long Island. As a young captain, Caldwell takes pride in what he does and intends to keep small-boat fisheries alive for the next generation. Kimberly Hyde is based at the Narragansett Laboratory of the National Oceanic and Atmospheric Administration’s Northeast Fisheries Science Center. She performs research on phytoplankton abundance using satellite data. Satellite data enables Hyde to analyze how the species composition of the phytoplankton community changes over time, and to gauge the potential impacts of these changes on fisheries production on the northeast U.S. continental shelf. Her doctoral dissertation at the University of Rhode Island’s Graduate School of Oceanography used ocean color data to study phytoplankton dynamics in Massachusetts Bay. 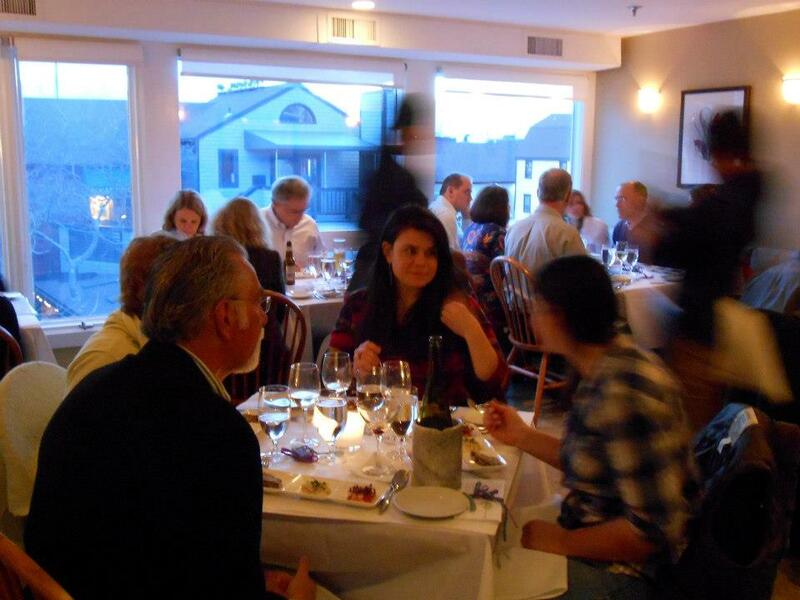 Fluke Wine Bar and Kitchen is located at 41 Bowens Wharf Newport, RI 02840.